We have yet to see leaked renders of Samsung’s upcoming smartwatch but it appears that the company has leaked the Galaxy Watch on its own website. 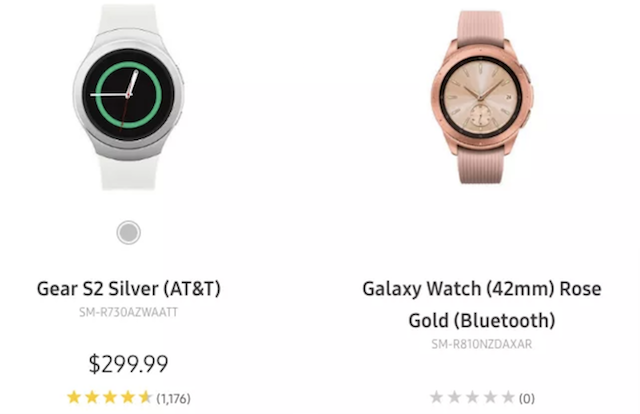 A listing for the Galaxy Watch was spotted earlier today on Samsung’s official US website and mentioned the SM-R810 model number. It’s already known that Samsung has developed two models of the Galaxy Watch – the SM-R800 and SM-R810. Both of these models have already been certified by the FCC. The listing was for the latter and while the link led to a dead page, it did show a photo of the Galaxy Watch and mentioned that this is the 42mm model. We recently reported that the two Galaxy Watch models will offer different screen sizes. That does appear to be the case if this listing is anything to go by. The report mentioned that the SM-R800 will have a 1.3-inch display and will measure 46mm. The SM-R810 was mentioned as the 42mm model with a 1.2-inch display. The size of this model has thus essentially been confirmed by Samsung itself. 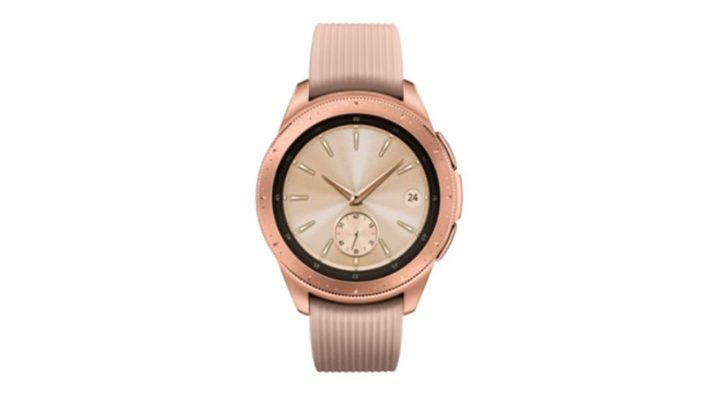 The listing was found on a page which listed previous models of Samsung’s smartwatches including the Gear S2, Gear S3 and Gear Sport. Samsung is moving away from the Gear branding for its smartwatches. The upcoming wearable device will be called the Galaxy Watch instead. We have confirmed exclusively that despite the move to the Galaxy branding, the smartwatch will indeed be powered by Tizen OS. As expected, the listing was quickly removed from Samsung’s website after word of it spread online. The accompanying image shows that there aren’t any major design changes compared to existing models but the new Rose Gold color will certainly be appealing to many customers. My girlfriend likes my Gear S3 Frontier and wants one but she complains that it’s too masculine. She’d definitely love this.